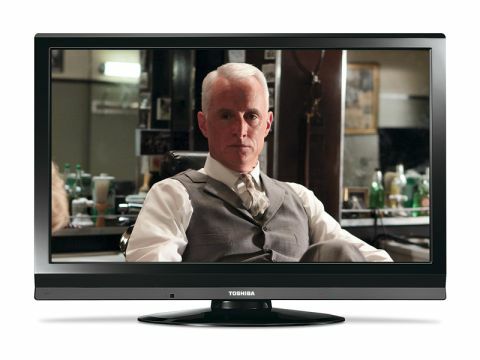 The Toshiba 42AV635 doesn't look like a TV that costs just £525. Its finish is solid and glossy and the illuminated Toshiba logo is a classy touch. It's extremely well connected for its money, too, with highlights of four HDMIs and a USB input capable of playing JPEG stills. Despite being Toshiba's entry level 42in LCD TV, the screen even carries a healthy number of picture features and adjustments. It's still got the brand's Meta Brain (the umbrella name for a suite of picture processing tricks, including the multi-tasking Active Vision II); the AutoView system that continually compensates for both ambient light levels and the content of the images you're watching and last, but not least, Resolution+. Provided you're careful not to set it too high, the scaling circuitry can do a really startling job of making standard-def pictures sharper and more HD-like without pushing up noise levels. The 42AV635 also goes beyond the call of budget TV duty by providing a colour management system and such unusual fine-tuning options as a static gamma sliding bar, plus a similar system for balancing black and white levels. As you would expect, with so much room for adjustment it's possible to get some really excellent results. High-definition pictures, for instance, look impressively sharp and detailed provided you deactivate all overscanning and noise reduction circuits. And, as mentioned earlier, standard-def images are a cut above the norm, too, provided you strike the right balance between Resolution+ and the noise reduction routines. Meanwhile, the set handles motion far better than expected for such a cheap, non-100Hz model with minimal blur, and no more judder than we'd expect to see at this price level. Most colours look pretty good, too: certainly bright scenes look punchy and believable and skin tones are surprisingly consistent. However, some greens and reds seem just a little unnatural during dark scenes. Another problem manifests itself during unlit scenes: a very uninspiring black level response. Even using the set's Cinema preset, which tones down the backlight output and shifts the black/white balance strongly towards black, dark scenes appear behind a distinctly grey wash, losing detail and depth in the process. Our sample also suffered from a distracting patch of extra brightness in the bottom left corner. The 42AV635's audio, meanwhile, is about average, with reasonable amounts of volume, but not quite enough dynamic range to avoid mid-range compression and the lack of bass so common to flat TVs.